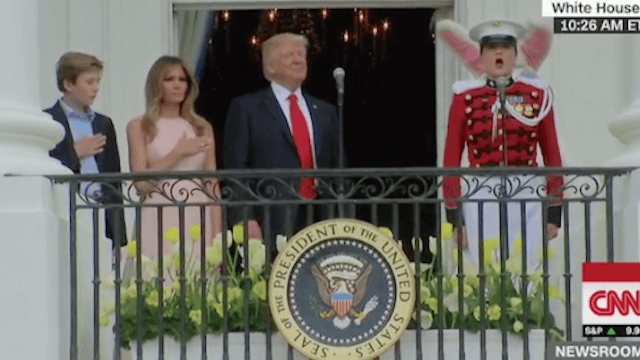 See the moment Melania Trump reminded Donald how he's supposed to act during the national anthem. Donald Trump may be President of the United States but that doesn't mean he knows the proper way to stand during the singing of our national anthem. Luckily for him, his wife Melania was right by his side, ready to remind him that your hand goes over your heart. Maybe Donald and Melania Trump have practiced this in the past, and he just needed a quick refresher. One can imagine their conversation during the trial run: "Okay, honey, your hand goes over your heart. No, not my heart, YOUR heart. Nope, other side. Good, there you go! Now just remember to keep it there during the whole song…don't let it wander off, God only knows where it'll end up." As usual, Twitter had a bit of fun with Trump's national anthem confusion. I'm surprised he found one. Quite telling that the first lady, an immigrant, had to remind him. To be fair, it probably IS pretty hard for Donald Trump to find his heart.